Like most cities in the metro Toronto, Oakville mortgage rates are better than average due to extreme house prices, which spawn large profitable mortgages. The following are the lowest rates from lenders and brokers with operations in or near the city. For providers in surrounding locations check the best rates in Ontario. 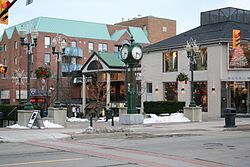 City in Brief: Oakville is located in Halton Region on the western shores of Lake Ontario. The city is just 30 minutes from downtown Toronto and is therefore home to a large number of commuters. It boasts hiking trails and two harbours for avid boaters. Ford Motor Company’s Canadian headquarters and manufacturing plant are both located in the city, providing considerable employment.